This exceptional Georgian style detached property will appeal to the discerning purchaser seeking a first class family home, that is situated on a plot of four acres in size with woodlands found to the rear and left boundaries. Reception Hall Oak staircase to first floor with under stairs cupboard, oak floorboards, circular window to front elevation, two traditional style radiators, oak small pane doors to kitchen, lounge and inner hallway. Sitting Room17'10" (5.44m) (into bow) x 13'5" (4.1m). Marble fireplace with coal effect gas fire, feature bow window incorporating three Georgian style sash windows to rear elevation, two radiators, picture rail and two internal Georgian style sash windows. Kitchen15'8" (4.78m) (extending to) 20'10" (6.35m) x 11'2" (3.4m). Extensive range of bespoke hand made units by Jaga of Alresford. Granite work surface, matching range of eye units with background lighting, inset one and half bowl sink unit with mixer tap, separate spray attachment, feature circular window to front elevation, Georgian style window to front elevation, double larder cupboard with side cupboards, gas fired Aga, Miele four burner gas hob with cooker hood over, oven/grill, integrated dishwasher, servants bell indicated board, peninsular unit with granite worksurface and mirror with overhead utensil rack with downlighters, lime stone tiled floor with electric underfloor heating Miele fridge/freezer, Miele microwave and steam oven, Miele integrated dishwasher and zip cold/boiling tap. Side Lobby Tiled floor with gas fired underfloor heating, open arch doorway to boot room with oak shelf/coat hooks and door to side elevation. Utilty Room13'5" x 6' (4.1m x 1.83m). Continuing the range of base units with granite work surfaces over, matching eye level units, inset one and half bowl sink unit with mixer tap and separate spray attachment, lime stone tiled floor, integrated freezer, space for tumble dryer, plumbing for washing machine and plumbing for drying cabinet, wicker drawers and gas fired underfloor heating. Cloak Room White suite comprising close coupled WC with concealed cistern, wash hand basin set in marble surround, large mirror with downlighters over and lime stone tiled floor. Boiler Room Two Worcester gas fired boilers, hot water cylinder, electric immersion heater, quarry tiled floor and digital time control switch. Inner Hall Bath stone tiled floor, radiator and oak small pane frosted door to pool room. Changing Room Tiled floor, Georgian style window to front elevation, shelf, clothes hook, wooden seats, chrome heated towel rail, hair dyer, mirror and glass shelf. Cloak Room White suite comprising close coupled WC with concealed cistern, mini wash hand basin, Bath stone tiled floor, half tiled walls and extractor fan. Plant Room Housing filtration equipment, boiler, de-humidifying unit, water softener, fuse boards etc. First Floor Landing Small pane window to front elevation, traditional style radiator, oak balustrade, stairs to second floor and shelved linen cupboard with electric heater. Dressing Room13' x 6'4" (3.96m x 1.93m). Georgian style window to rear elevation overlooking the garden, radiator, range of drawers, shelves and hanging space and large mirror with overhead downlighters. En-Suite Impressive white suite comprising deep bath with side mounted mixer tap, close coupled WC with concealed cistern, corner shower cubicle with overhead shower unit, separate shower mixer tap, twin wash hand basin set in marble work surface, small pane Georgian style windows to front and side elevation, mirror, chrome heated towel rail and electric underfloor heating. Bedroom Two17'10" (5.44m) (into bow) x 13'8" (4.17m). Feature bow window incorporating three Georgian style windows to rear elevation overlooking the garden, picture rail, radiator and two Georgian style windows to side elevation. Bedroom Three12'9" x 11'5" (3.89m x 3.48m). Two Georgian style windows to rear elevation overlooking the garden, two radiators and picture rail. Bedroom Four11'2" x 9'1" (3.4m x 2.77m). Georgian style sash windows to front and side elevations, radiator and picture rail. Bathroom11'5" x 7'4" (3.48m x 2.24m). Well appointed with a deep bath in marble surface with side mounted mixer tap, wash hand basin in marble surface, mirror, corner shower cubicle with overhead shower, separate shower mixer tap, close coupled WC with concealed cistern, two Georgian style windows to elevation, shelved double cupboard, fully tiled walls, tiled floor and electric underfloor heating. Bedroom Five15'1" (4.6m) x 7'3" (2.2m) (plus dormer). (An optional sitting room) Double glazed Georgian style dormer window to rear elevation overlooking the garden, radiator, internal etched glass panel, high level vaulted ceiling, TV point, ornamental cast iron fireplace and door to walk-in wardrobe. Bedroom Six15'4" (4.67m) x 11'10" (3.6m) (plus dormer). Double glazed dormer window to rear elevation overlooking the garden, two radiators, ornamental cast iron fireplace, small door to roof storage space and high level vaulted ceiling. Bathroom Double glazed window to front elevation, white suite comprising corner shower cubicle with overhead shower, close coupled WC, pedestal wash hand basin, mirror, radiator/heated towel rail and half tiled walls. 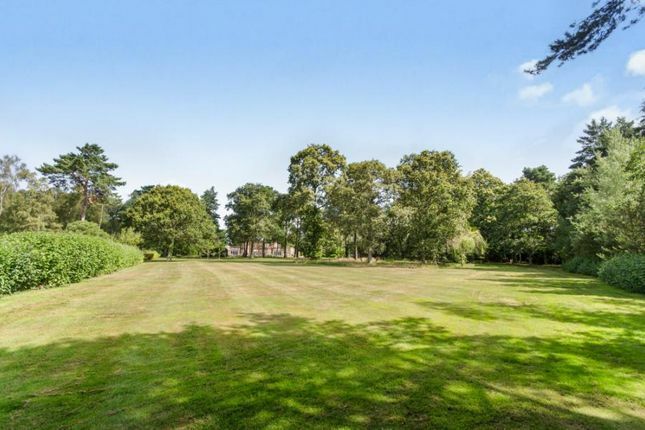 Outside The landscaped grounds are an outstanding feature and are four acres in size and provide a secluded and private setting for this property. The property is approached by two sets of solid automatic gates in brick pillars with an intercom entry phone system. The in and out driveway has low level courtesy lighting and leads to the bonded gravel parking area providing parking for numerous vehicles.There is a double bay oak framed barn and ornamental tennis gazebo. There is also sensor control courtesy flood lighting, outside taps and power points. Landing Area Small paned window (facing the house), work surface with circular sink unit and mixer tap and double cupboard below. Office14'8" x 11' (4.47m x 3.35m). Electric heater, ornamental cast iron fireplace, small pane window, access to roof space and two doors to under roof storage space. Gym14'6" x 11' (4.42m x 3.35m). Electric heater, small pane window, access to roof space and door to under roof storage space. The remainder of the grounds have been superbly landscaped. There is an extensive patio across the width of the house that enjoys a south westrerly facing aspect. Hard surface tennis court with high fenced surround, ornamental gentleman's tennis retreat with fitted seating. The remainder of the grounds have extensive lawned areas with areas of mature woodland and shrubs. There is an oak framed barn style building ideal for garden machinery etc., covered log store. Simon Edser is dealing with this property and to view please call Morris Dibben on .